← Restaurant Review: Porter’s City Tavern, Raleigh, N.C. 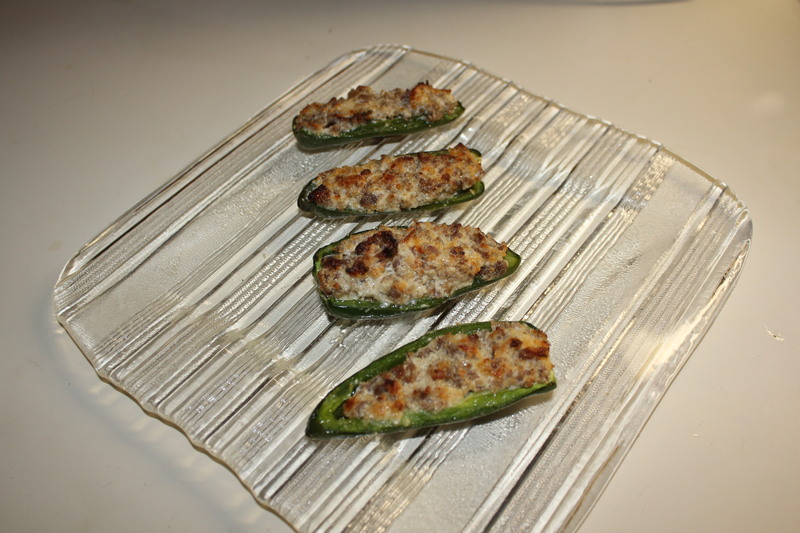 The first time I had these wonderful stuffed jalapeños was years ago on a beach trip. My dear friend Martha whipped up a batch of them and I’ve been hooked ever since! They are so easy to make and seriously addictive. I plan on taking these to a Super Bowl party this weekend and can’t wait to watch them disappear! 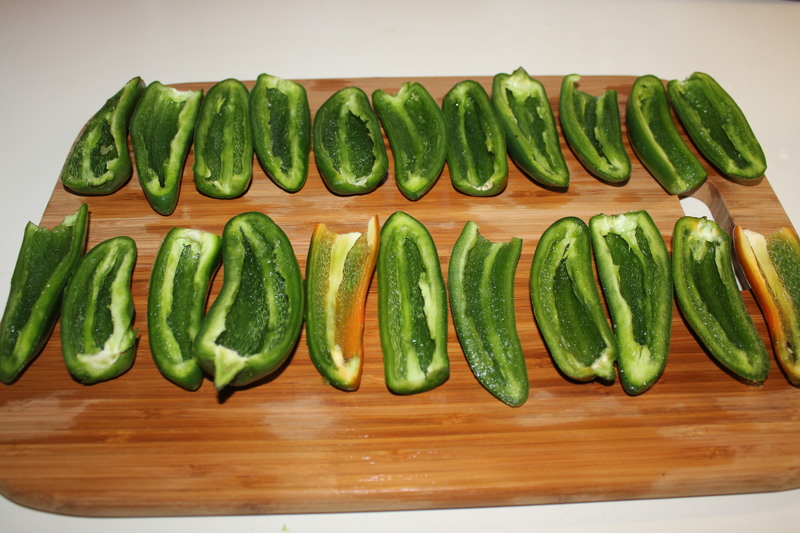 Slice the jalapeños lengthwise and remove the seeds and membranes. You should wear latex gloves for this step so you don’t get any of the oils from the jalapeños on your skin or, worse yet, in your eyes. Trust me on this one – getting jalapeño oil in your eyes hurts like hell. 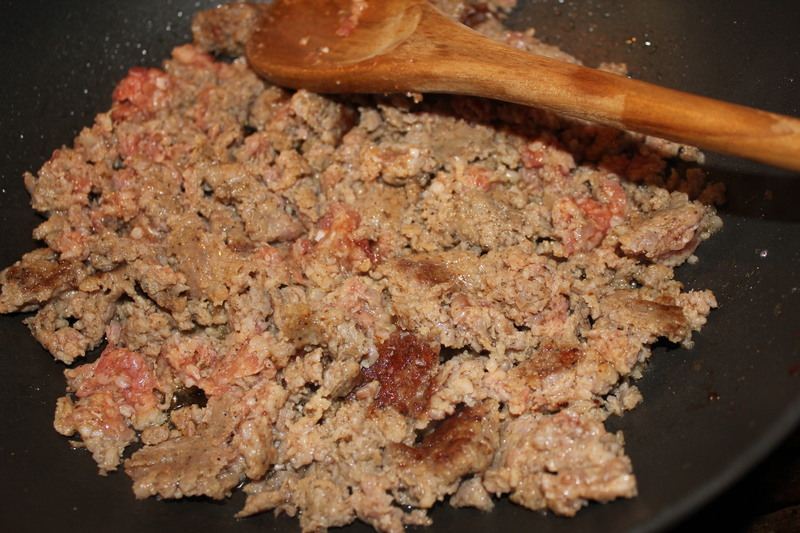 Mix the cooked, drained sausage, softened cream cheese and the Parmesan/Romano cheese in a large bowl. Fill each jalapeño half with the sausage mixture, and place on a large baking sheet lined with aluminum foil for easy cleanup. 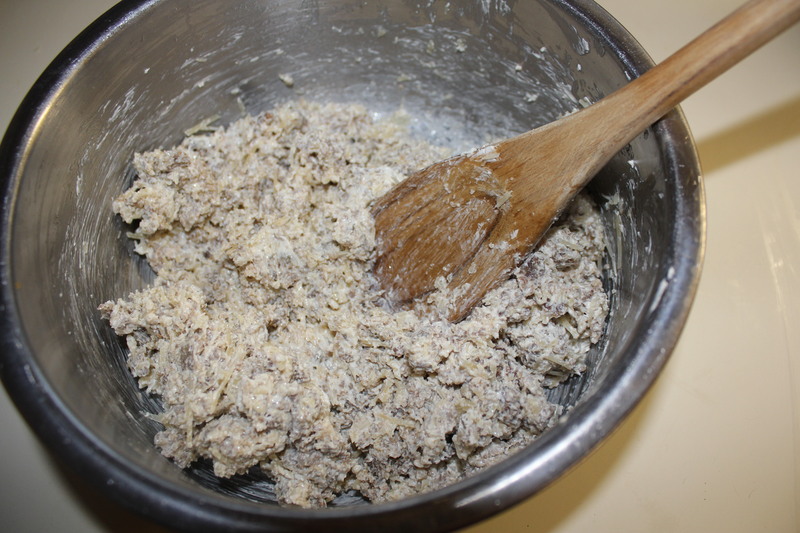 Bake for approximately 20 minutes, until the tops are lightly browned. Let the peppers cool down for a few minutes before serving. 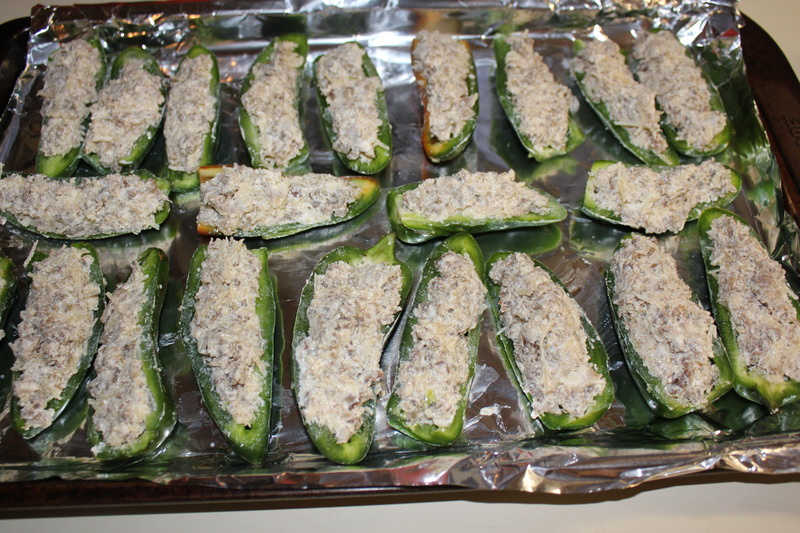 If you are serving these at a party, you may want to double this recipe – these wonderful stuffed peppers won’t stay around long! 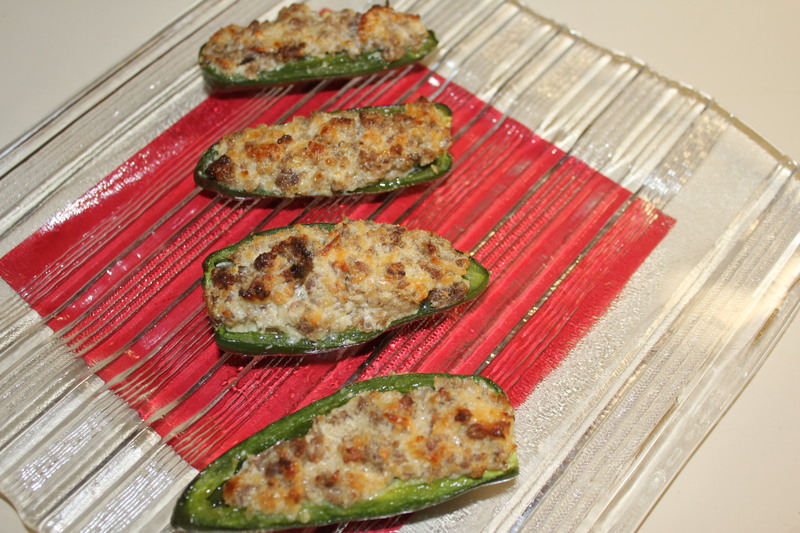 This entry was posted in Appetizers, Meat and Poultry, Recipes and tagged eat drink and be merry, jalapenos stuffed sausage cream cheese, kel's cafe of all things food, Kelley Chisholm blog, Kelley Chisholm recipes, stuffed jalapenos, Super Bowl appetizer, Super Bowl recipe. Bookmark the permalink. Eyes? Shoot, the last time I messed with jalapenos w/out gloves my hands burned for three days. I don’t want to know what my eyes would feel like w/ the oil in them.